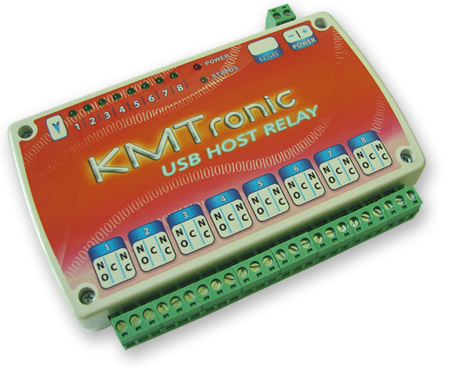 Multifunctional 8 Relay board with USB Host interface. USB Host allo to connect to board and control relays using any ready USB Device like Bluetooth, Joystick, Keyboard, Remote control, Mouse, RFID Reader, HID devices or custom developed modules. Build open source universal relay board with possibilities control using any ready or custom made USB device. Outputs: 8 relays each capable of switching 12VDC/10A or 240VAC/7A. Each relay has an LED to indicate when it is operated.